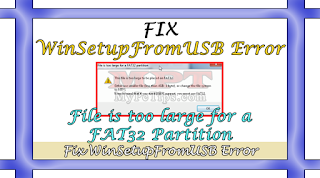 The error usually comes when you try to use an ISO image more than 4 GB which notify you to use NTFS partition instead of FAT32. Even using NTFS File Format the error still persists in WinSetupFromUSB Application. So i'm going to share this video for my those viewers who are having this error and still they didn't fix it. Basically it is not an error it's just a caution and warning or you may call it notification but the problem is until you pass this caution you will not be able to proceed with. It will restrict you there and you can't go anywhere using WinSetupFromUSB. But I genuinely call it a minor bug because the Application probably lost automatically collecting checked information or switch feature. Maybe in future developer of this program might fix the issue in their updates but as we and I know that this is coming up so I made this Tutorial to pass this warning within seconds. The file is too large to be placed on FAT32. Either use smaller file (less than 4 GB - 1 byte), or change the file system to NTFS. 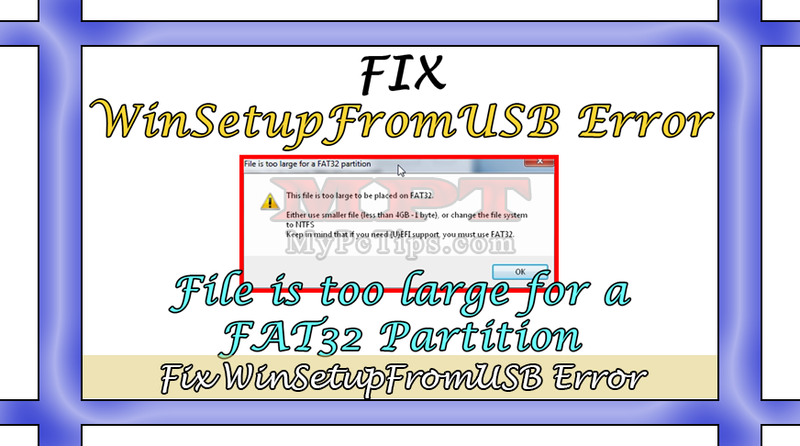 Keep in mind that if you need (U)EFI support you must use FAT32. Check "AUTO FORMAT IT WITH FBINST" and Choose "NTFS". Now mainly before proceeding, just Hit "REFRESH" button beside USB Disk Selection. And then Check "WINDOWS VISTA / 7 / 8 / SERVER 2008/2012 BASE ISO" and Hit "BROWSE / 3 DOTS ..." button then find and choose your Windows ISO file. Hit "GO" button and wait until it says "JOB DONE". The issue was avoiding 3 point 'Refresh' button, it causes the subject error.